The DG of National Emergency Management Agency (NEMA), Mustapha Maihaja, has been under investigation for alleged violation of public trust, financial improprieties and mismanagement of relief materials from donors. Among other allegations, the House of Representatives committee on national emergency and disaster preparedness is grilling the NEMA boss on how the agency managed 6,779 metric tons of rice donated by the Chinese Government to internally displaced persons in Nigeria. According to Saharareporters, NEMA did not commence clearance of rice for more than six months after the rice donation had entered the shores of Nigeria. Hence, over 5000 bags of the rice, meant for Internally Displaced Persons (IDPs) in the Northeast region, had spoilt before the agency disbursed to the various camps in the region. .
During the interrogation of the NEMA boss by the committee, it was revealed that over 100 containers of rice are yet to be cleared at the ports. Already, the rice had cost taxpayers N400 million as demurrage and additional N161 million expenditure on delivery and logistics. The committee presided over by the Deputy Chairman, Ali Isa, also queried NEMA for allege N3 billion rice contract awarded to Olam Nigeria Limited and Two Brothers without checking for tax clearance of the companies. The NEMA boss, however, denied wrongdoing, saying the agency engaged the companies “under emergency as prescribed under Emergency Act”. There has been power tussle between the house of reps’ committee and the leadership of the agency. The committee, addressing pressmen on Tuesday, said the it would not be blackmailed into backing out of the investigation into the alleged diversion of N23 billion funds approved for NEMA under Maihaja. 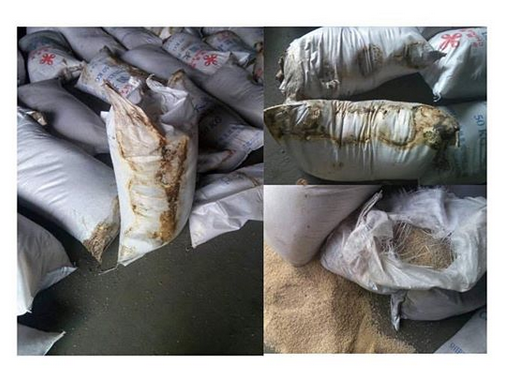 0 Response to "Containers Of Rice Donated by Chinese Govt Rot In NEMA’s Warehouse"